When Picard denies Q a place on the Enterprise crew, Q introduces them to their most dangerous enemy yet. This is the most important episode since the pilot, "Encounter at Farpoint." 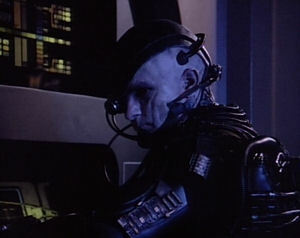 Much of the show has been building up to the introduction of the Borg: "The Last Outpost" tried to separate TNG from TOS by introducing a new villain; "Where No One Has Gone Before" reinforced the notion that there are things out there for which the Federation is ill-equipped; "11001001" introduced the concept of a biomechanical race that finds power in hive-minded cooperation; "Conspiracy" tried to strike a darker, more ominous and terrifying tone; and "The Neutral Zone" set the narrative stage. However, I think the episode that best foreshadows this one is "Elementary, Dear Data," because in that episode, it is suggested that the only way to truly test someone--in that case, Data--is to present him with an opponent that he cannot defeat. Here, that is precisely what the Borg are in relationship to the Enterprise crew, an opponent they simply can't beat. The reason this episode is so successful--while earlier episodes that tried to do similar things are not--is that it comes along at the right time. The characters have finally reached a point in their development where the writers and actors are all comfortable. Additionally, while no Star Trek show ever truly stops experimenting, TNG had finally gone through enough experimentation with the formula by this point that the creators knew which ideas worked and which did not. "Q Who" starts in the most innocuous way, with the introduction of Sonya Gomez, a jittery new ensign in Engineering. She yaps Geordi's ear off, waxes philosophic about the dehumanizing aspects of technology, and then bumps into Captain Picard, causing a scene by accidentally covering him in hot chocolate. It seems like wacky hijinks--a light scene to make up for all the dark stuff that is to follow--but upon closer examination, it anticipates the Borg's arrival. Within the first few seconds, you have somebody implying that mankind's dependance on technology is taking away what makes us human, and if that isn't a statement about what the Borg represent, I don't know what is. More than that, an individual like Sonya Gomez can't exist on a Borg vessel, because with her constant jabbering and bumbling, she is an inefficiency to be squashed. She, in essence, represents the human element that Borg technology is intent on destroying. Since we're on the subject, let's really look at the Borg, from a thematic standpoint. One of the central points the original Star Trek was trying to make, as a show being made at the height of late-1960's social upheaval, is that we are stronger when we are united as a cohesive whole. The entire Federation was built on this premise, to unite the many races into a strong central body. The only difference between this ideal and the Borg (and the TOS Klingons) is that the Borg don't respect diversity, they simply assimilate it. The Borg, then, can be seen as a dark version of the Federation*, a terrible bastardization of some of our most important values. Indeed, later in the episode, but before the curtain rises on the Borg, Guinan identifies some of humanity's strengths. "They adapt," she says to Q. During the same conversation, Picard insists that humanity is "resolute" and "determined." The Borg can be defined the same way; they adapt, and they are resolute ("relentless," to use Q's word). If they differ from humanity in these traits, it is only in degrees, because the Borg adapt much quicker and are more determined. The terrifying part is the fact that they are also more advanced. When Gomez talks about the dehumanizing effect of technology, she is actually voicing a sentiment that seems to go against Gene Roddenberry's original vision. Another core ideal that the Borg twist in devilish ways is the uplifting nature of technology. Roddenberry believed that technology makes us better, makes us more than we are, and will inevitably raise us to greater heights of peace and morality, but the Borg take technology in a completely different direction, towards something less peaceful and less moral. This is not to argue that Roddenberry would have been against the Borg, because he was still alive--and his green light was still necessary for every concept--when the Borg came along. For Roddenberry, the Borg are probably a warning, a frightening vision of what could be if we let our morality slip at any point in our technological evolution. The Borg are hardly the first time in science-fiction that extreme cybernetics have been explored. It's not difficult to scour older sci-fi to find every idea and every concept that make up the Borg, like puzzle pieces scattered over thousands of stories and just waiting to be put together. However, what the Borg lack in true originality, they make up for in poignancy. The Borg are effective because they combine all these bits and pieces from our collective unconscious and present them as a monster that has been dwelling in our nightmares all along, and though that makes them seem timeless, the Borg are uniquely speculative; they could only exist in science-fiction. In short, the Borg are a deep, timely, and meaningful symbol, the first truly relevant idea to appear in TNG. This episode, then, is the show finally growing up, finally moving out of its parent's basement and into a world of its own. From this point on, TNG and TOS are separate. Though they always maintain the connective tissue that unites all aspects of the Star Trek universe, TNG follows its own path from here on out. That path was paved in earlier episodes, but it isn't until this one--it isn't until we meet the Borg--that the show boldly commits to that new path. *If you want to make a case for there being an anti-Federation, the Dominion fits the bill better than the Borg. This is the only episode in which both of TNG's central antagonists, Q and the Borg, appear.